When World War 1 broke out in August 1914, New Zealand was allocated the task of capturing German Samoa. A fleet of six warships from Brit­ain, Australia, France and New Zealand was assembled in Auck­land as part of a British Expedi­tionary Force that was officially referred to in NZ as ‘The Samoa (New Zealand) Expeditionary Force’. Colonel Robert Logan of the NZ Army was put in charge of the Expeditionary Force made up of about 1,500 soldiers and sailors. The Force left Auckland in early August 1914 and called into Suva to pick up ten soldiers from the Fiji Defence Force and 15 Samo­ans living in Fiji who were to act as guides and interpreters for the Force when they arrived in Apia. The Samoan guides and interpret­ers were led by Moefa’ano Melea, the chief guide. On 29th August 1914 the German Governor handed over Apia to the invasion force without a shot be­ing fired. After the landing Private Herbert Floyd Bailey of the Fiji contingent noticed that the Ger­man flag was still flying over the Courthouse which formed part of the German Government Build­ings in Apia. He rushed forward and quickly hauled down the Ger­man flag. Later that afternoon the Union Jack was ceremoniously hoisted in its place. 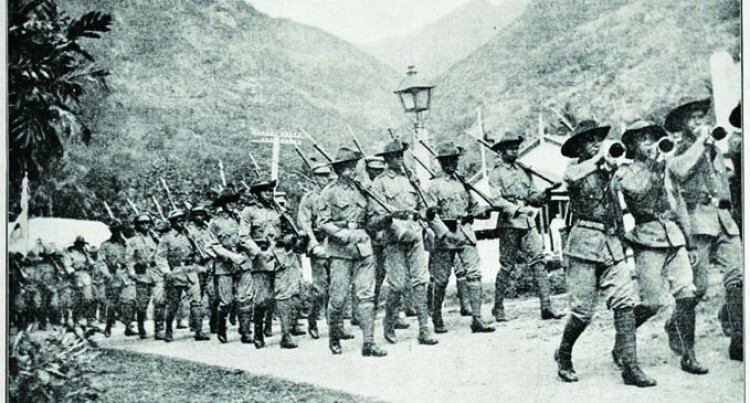 After the capture of Apia several German residents were taken pris­oner. Five of them were put on the NZ troopship Monowai and sent to Suva. The five prisoners sent to Suva were Dr Schulz, the German Governor of Samoa; his private secretary Herr Marz; Comman­dant Hirsch, the controller of the wireless station in Apia, and Herr Hansen, a merchant of Apia who took with him his Samoan servant. The German prisoners were treated very well in Suva. They were given a suite of rooms at the Grand Pacific Hotel (GPH) where they were able to enjoy many vivid tropical sunsets over Suva Har­bour . Unfortunately for the Ger­mans, the reality was that they were being detained at His Majes­ty’s pleasure in the Crown Colony of Fiji and the courtesies extended to them there did not include free alcohol service. During their month long stay in Apia the Fiji soldiers were attached to the intelligence section of the Force. They were also engaged in the task of commandeering horses and wagons etc for use by the oc­cupying troops. Some Fiji soldiers were attached to the 3rd Auckland Regiment and were employed visit­ing houses and villages in and out­side of Apia to ensure that orders relating to firearms were carried out by the local Samoan popula­tion. The Samoan guides and interpret­ers recruited from Fiji provided valuable service for the occupying Force. They were later each given certificates for their”excellent and loyal service they had rendered the British Expeditionary Force”. Melea spoke for the NZ colonial power that had just invaded Sa­moa. He did not have the mandate of the Samoan people to speak on their behalf. Colonialism divided Samoan against Samoan. It was the rise of the Mau movement in the 1920s and 1930s that galvanised political unity in Samoa. But that’s another story for another time. Sa­moa became an independent state on 1 January 1962 with its own na­tional flag and Head of State. The Samoans remain a God-fearing and proud people with a strong culture and traditions.